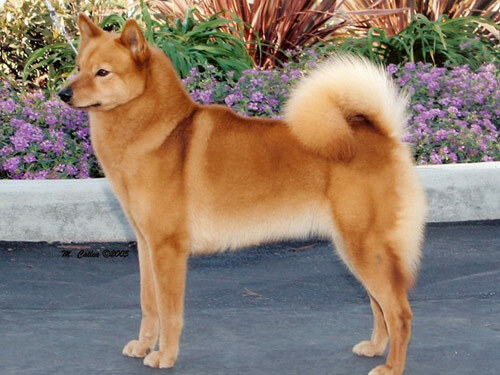 All of the members of the Spitz breed are notorious for being somewhat stubborn and even a tad independent at times, but the Finnish Spitz is unique in that it is well known for its hunting capabilities over their temperament. A laid back canine, but very playful and curious. The male Finnish Spitz dogs are more aggressive and can be territorial. They can be very adaptable with little ones in the home along with other canines, but not as friendly or welcoming toward other dogs they are not familiar with. They can bark when they feel it is deemed necessary and can be very loud and dominating with their barking. If you reside in a home that bodes a fenced in yard, one that can preferably permit the Finnish Spitz dog to roam freely about during the day, then this is the ideal environment for them. They will at the very least require a brisk walk around the neighborhood as they can be very active and require physical exercise. Considering they are hunting bred animals, they should not be permitted to roam around a space that is not fenced in as they can run off to hunt small vermin. They easily can adapt to virtually any temperature and should reside most of the time in an indoor environment and not outdoors all year long. They enjoy being with their families and can be very affectionate. They make great watchdogs and can provide some form of protection in a dangerous situation if needed. They are also rather simple to train even as pups. They do bode a thick coat of fur that will require some grooming maintenance and a brushing a minimum of twice per week should suffice. One great quality about the Finnish Spitz breed is that they do not usually bode any major health developments, unlike most other dogs. They can develop CHD, epilepsy and patellar luxation as they age. The average lifespan for a Finnish Spitz is from twelve to fourteen years, with a typical weight from twenty to thirty five pounds as full grown dogs. The Northern Spitz family of dogs are what is thought of as the originating the Finnish Spitz breed. Some experts believe they are the canines that previously used to travel alongside Finno-Ugrian tribes on their missions from Eurasia to Finland. Great for hunting birds and small vermin, the Finnish Spitz had a sudden increase in popularity in the Ancient Times for their many uses. Once the 18th century came about, the breed had difficulty staying so popular, but they did begin to obtain a large fan bas in the United States in the middle of the 19th century. Their loud barking can be a frustration for those residing in homes with the Finnish Spitz breed, but they previously utilized that barking to hunt their prey. While most Americans will own one of these canines as family pets, those residents in Finland still own them as working and hunting dogs.